We all work hard for our money and, while it takes time to acquire, it disappears all too quickly. Sometimes it’s the small expenses we hardly ever think about that diminish our resources right under our noses. One of the ways we can save money is to take a look at what we’re paying in bank fees. Here are some tips to consider. The simplest way I know to avoid bank fees all together is to open an online bank account. One example, ING Direct Canada, Capital One 360, offers unlimited checking and debits but there are drawbacks to banking this way. In CANADA use orange code 42753252S1 when you open an account and get $50! In USA just go here and open an account and claim your $50 after completing your transactions. When you are a new client, there may be a holding period of a week before you can access the full amount of a deposit either for withdrawal or transfer. Needless to say, this can cause no end of trouble when the mortgage is due or you need grocery money. However, if your paycheck is deposited directly into your account, the hold is waived. Also, once you have an established history with an online bank, you can have any holds removed. Ask your bank for a break on fees. I’m sure that most banks appreciate the fact that you care enough about what you owe to ask for help when you need it, rather than letting payments lapse. They may even waive your banking fees for a period of time. Ask your bank if it would be possible to reduce the interest rate on credit cards and lines of credit. It certainly can’t hurt to ask and you may be surprised by the results. Every time your checking account goes into over-draft, you incur interest and the longer the account stays in over-draft, the more interest you’ll pay. It may be only a buck or two a month, but it’s all money that could be saved for your own use. Unlimited debit use will run you $11 to $15 a month at one of the big banks. That’s $132 to $180 a year. Instead of debiting for every purchase, figure out what you will need each month for groceries, gas and discretionary items and withdraw enough cash to cover everything. Some people use envelopes for each category of spending. You simply put the allotted monthly, bi-monthly or weekly sums in separate envelopes. When the envelope is empty, you’re done spending in that category for the period in question. This method will help you to avoid over-spending too, by encouraging you to think twice before making spontaneous purchases. When it comes to spending money, instead of withdrawing, say $40 four times a week, take out $160 once a week in order to reduce bank transaction fees. You won’t need to use your debit card so often if you can stick to using cash, so why not switch to a basic banking plan? The monthly fee for 10 to 15 transactions is around $4 a month on one of these plans. Depending on the bank, this fee will be suspended when you carry a monthly balance, usually $1,000 to $2,000. Using an online bank, paying bills online or over the telephone will cost you nothing. Other banks may offer the same service for free or at least at a reduced rate to using ATMs or tellers. Ensure you keep your information safe when banking online. There’s a fee of at least $1.50 when you use another bank’s ATM and your own bank will charge the same fee for the same transaction. I don’t know about you, but I resent those fees. Private no-name cash machines charge even more, so try to stick to using your own bank’s ATM machines only. When I think about retailers that allow you to add in extra cash before you pay for your purchases, Loblaw’s Super Store, Walmart and the LCBO immediately come to mind. Many other retailers will let you do this too, allowing you to avoid using an ATM that incurs a fee. Carrying extra insurance on your line of credit or mortgage may not be necessary if you have sufficient private life insurance coverage. Consider cancelling any extra insurance you may have on your bank accounts to reduce the monthly payments owed. You can save a fair bit of money over the course of a year just by putting a stop to all of the little cash leaks in your bank account and other banking services. 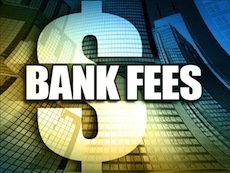 How do you safe on banking fees? I am stuck paying a monthly fee for my chequing account because I can’t seem to get up the minimum balance of $1,000 that is required to waive the fee. Under $100 in there right now and I am trying to get it up to the minimum because the chequing fees cost me $140 per year. I may use part of my tax return to meet the minimum but I may also want to put it in my RRSP to ensure a tax return next year. So many demands on my money, so little cash to work with.